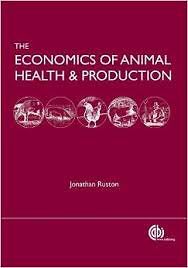 Illustrated with review studies on animal health economics, this book presents information on the most important economic tools applied to livestock, covering both theory and practical applications. Topics covered include gross margin analysis, partial budgeting, investment and financial appraisal and cost-benefit analysis. There are also sections on decision tree analysis, optimisation methods, value chain analysis, new institutional economics, DALYs and a range of policy analysis tools. International experts contribute on important theoretical and practical aspects of animal health and production economics, with global themes on livestock and poverty.